The Bearded Collie has evolved during hundreds of years to perform specialised tasks in the service of man and was first bred by sheep farmers to work the rugged ranges of the Scottish Highlands. As its working ability was all that mattered, there was no concern for accurately recording their history. 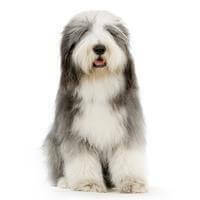 It is possible that the very early origins of the Bearded Collie may be found in the Polish Lowland Sheepdog, although this connection is not documented. A Bearded Collie will normally live to 15 years of age. Bearded Collies are happy, lively, energetic and affectionate family dogs. Visit a Beardie at home and you may well find it curled up on a couch or helping out in the kitchen. These dogs love to be where the action is and adapt easily to almost any situation. Most of all, Beardies love company and are not happy if locked outside and ignored. The breed is extremely affectionate and expects a lot of loving attention. These are sensitive dogs and do not respond well to harsh treatment. Generally speaking, do not expect a Bearded Collie to be much of a guard dog. They may bark at the doorbell, but will probably welcome burglars as if they were your best friends. Its beautiful coat does require some work to keep it looking glamorous. Compared with a smooth coated dog, a Beardie does need consistent and frequent grooming, however, unlike some long coated breeds, a thorough brush and comb through once a week will keep an adult Beardie in pretty good condition. Make sure that you keep your dog flea free, groom it regularly, keep it happy and in good health and your Beardie will thrive. Unless your dog is to be a member of your family, the Bearded Collie is probably not the dog for you. Many dogs demonstrate the combination of beauty and brains for which this breed is so renowned by competing successfully in obedience and agility competitions. This is an enjoyable option for owners who don't necessarily want to show their dogs, but would like to be actively involved in some other way.